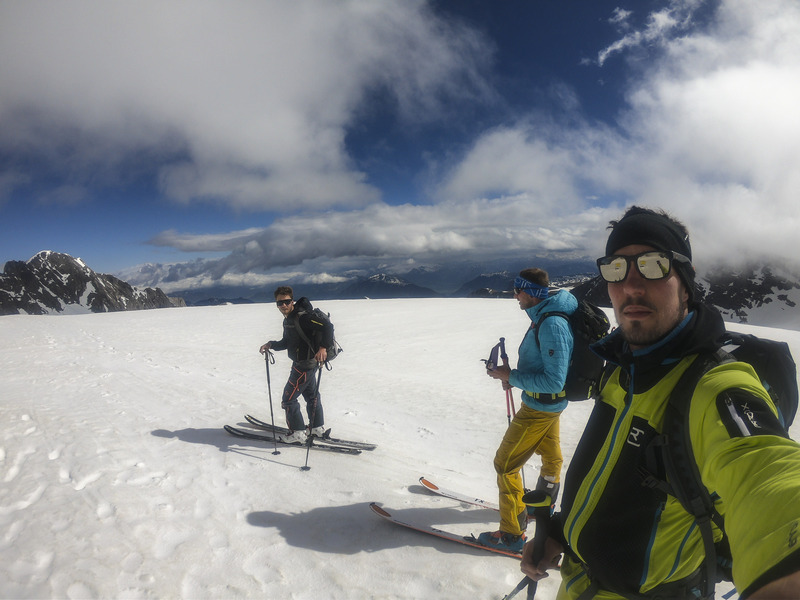 A few weeks before tackling the Hochfeiler adventure, the weather helped in ticking another objective of the “betweentwoworlds” list. 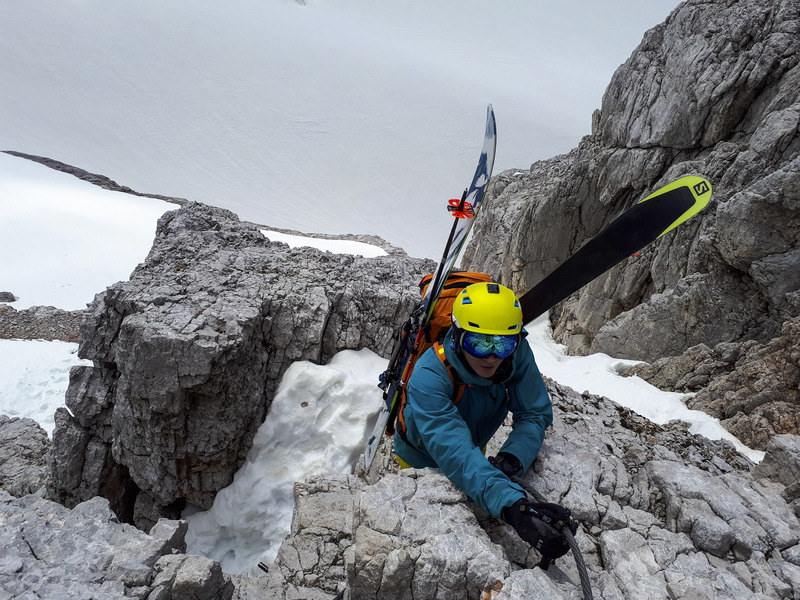 High above the western end of the Dachstein Plateu, the Torstein peak was waiting secluded in the clouds and really steep 🙂 Would we make it in time before the weather closed up ? 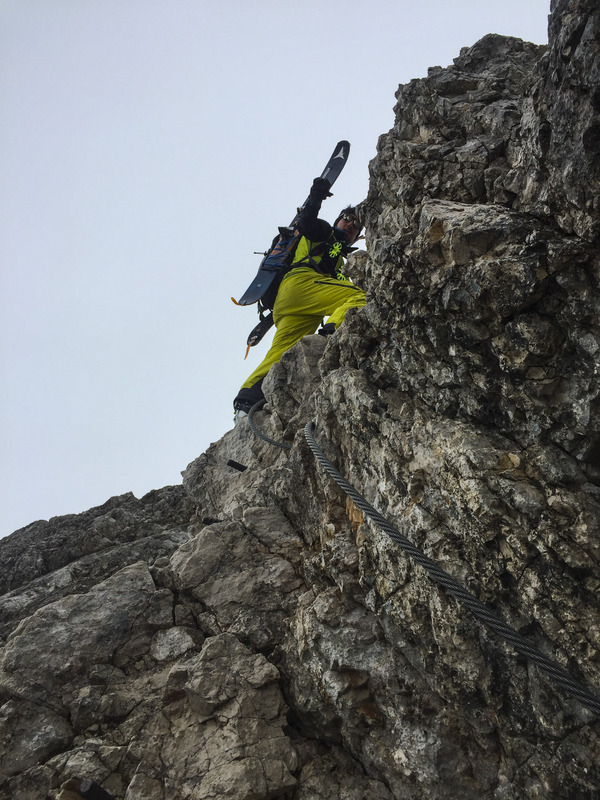 A few weeks before heading out to Hochfeiler I was working on my list of steep things to ride and while googling passed a click bait post on the Austrian RedBull page. Like a lot of click baits it dealt with TOP 5 stuff. I usually do not even look at that kind of crap but this one was naming the steepest things to ski in Austria. I looked it over and it seemed to fit a few of goals with the Pallavicinirinne at the Großglockner being the king of the list. While browsing on it I noticed a objective I must have passed up not even knowing for a long time. 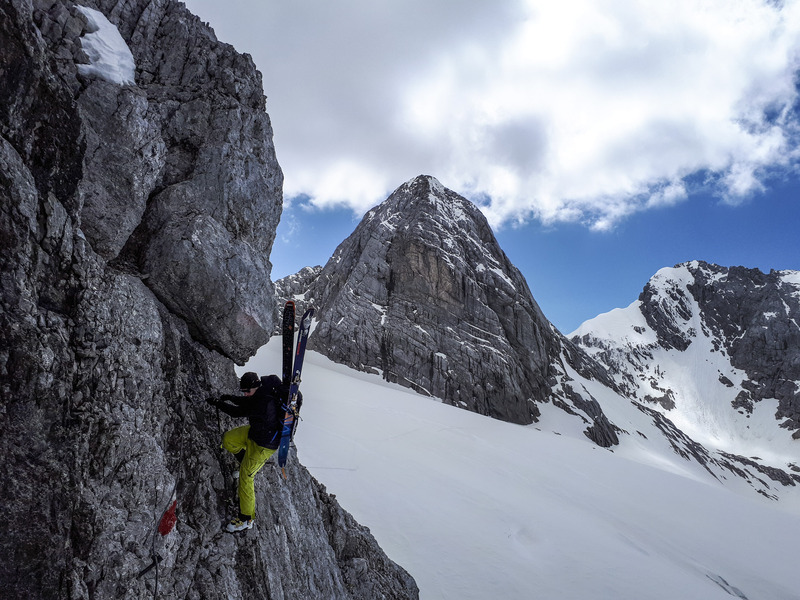 The Torstein at the western edge of the Dachstein. I put it on my list but did not thing much of it. While checking the descriptions, I was sure to put it into the later part of my list and did not think much of it. 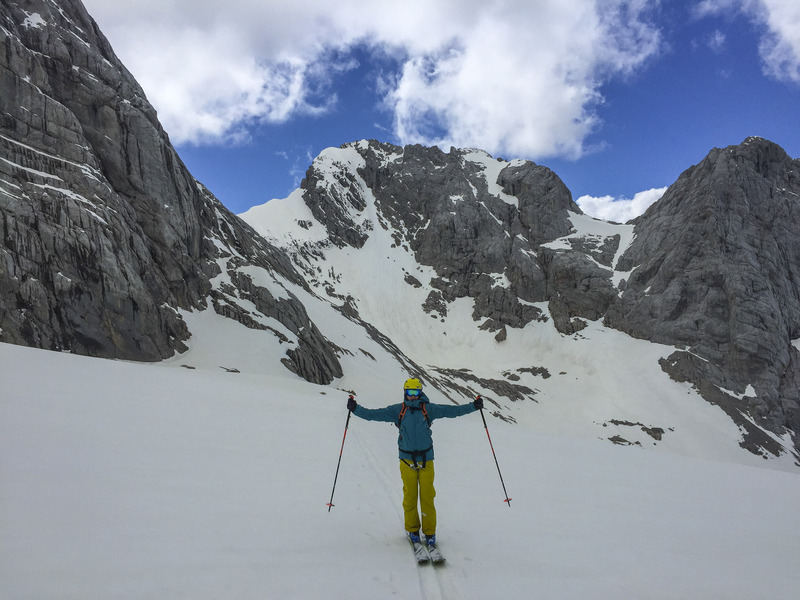 A weekend later I was in Innsbruck with Flo doing a nice log tour around the Stubai peaks. 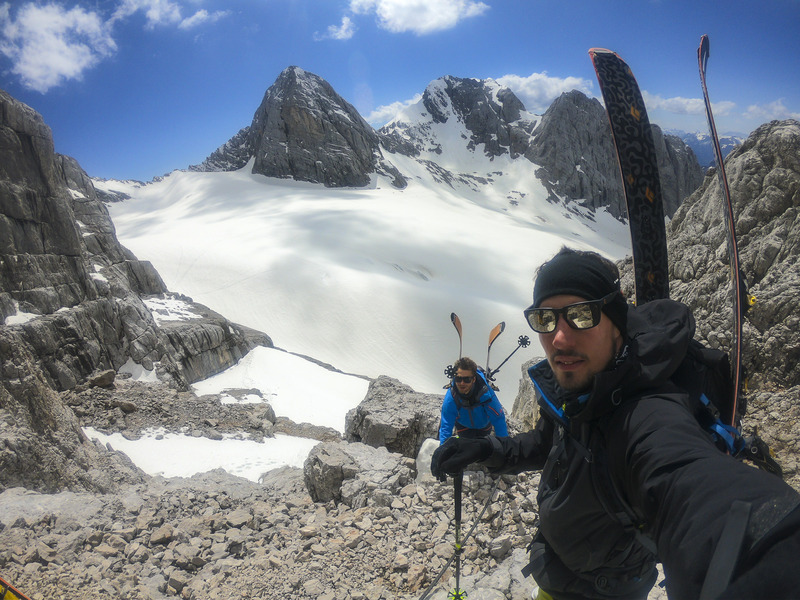 It was a holiday extended weekend and we had a plan to meet up with a few of Flos old buddies from home Manu Gruber and Christian Krobath, and then head to the Großvenediger. 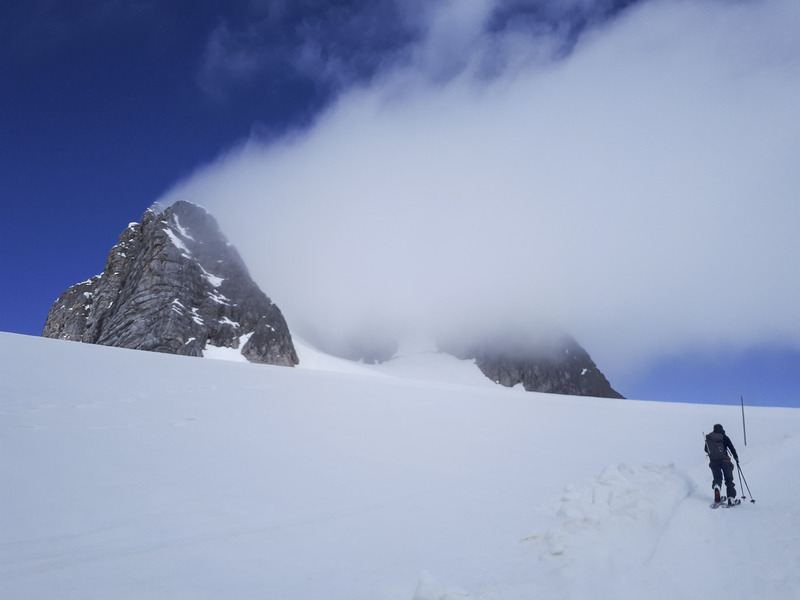 We would stay at a hut there for a few days and do five 3000+ peaks in the process. But then the weather changed abruptly. With snowfall and no visibility in sight for days we had to change up the plan. The overall forecast was crap and there would only be a short window. The weather would only be good for a day. 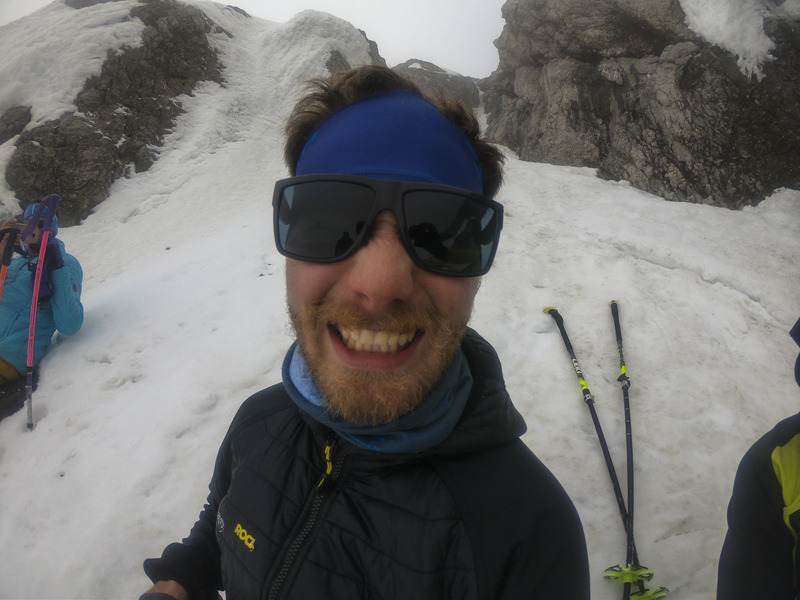 Since the Dachstein is half way to Styria and Innsbruck we figured out a quick plan. We had a sleeping opportunity there and if the cable car would work s we could try the Torstein. We constantly keept on checking the weather report. Even as we were driving up to the cable car station. We still did not know if we would be able to do it or not. The gamble was on. When we arrived at the parking lot we began to smile. The cable car was working. Still the webcams showed complete overcast. I had put the while track on my spratan for zero visibility navigation. Regardless of the bad first omen we decided to head towards the entry point for the climb. after all that would take a good two hours so there was plenty of time for the weather to go either way. 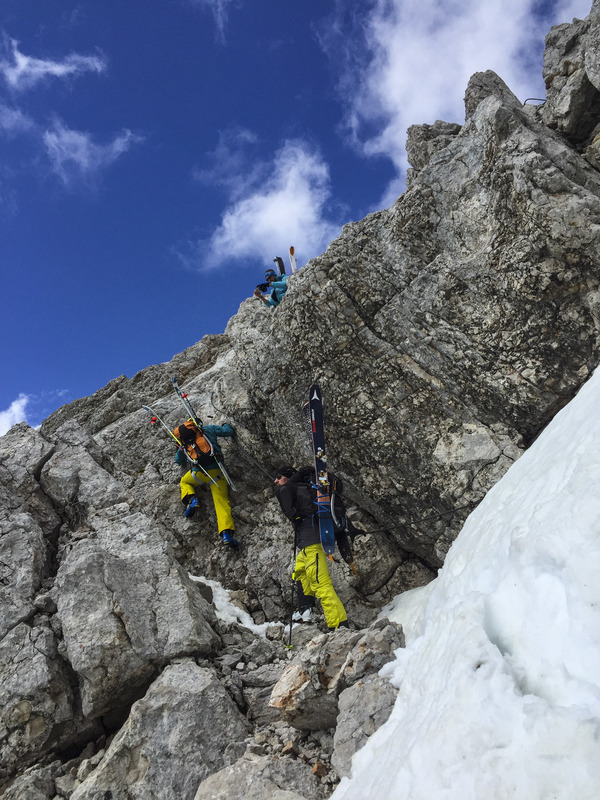 We departed the station on the route towards the Hoher Dachstein and the Simonyhütte. A awesome playground where I had spent one of the best new year powder adventures to date. This time thou we would not head neither left down the Plateu nor to the Right but go straight over a ridge. The we would have to descent over a secured area to make it to a glacier. Our tempo was good, but the weather was not playing along. When we reached the ridge the visibility was zero. It was decision time. 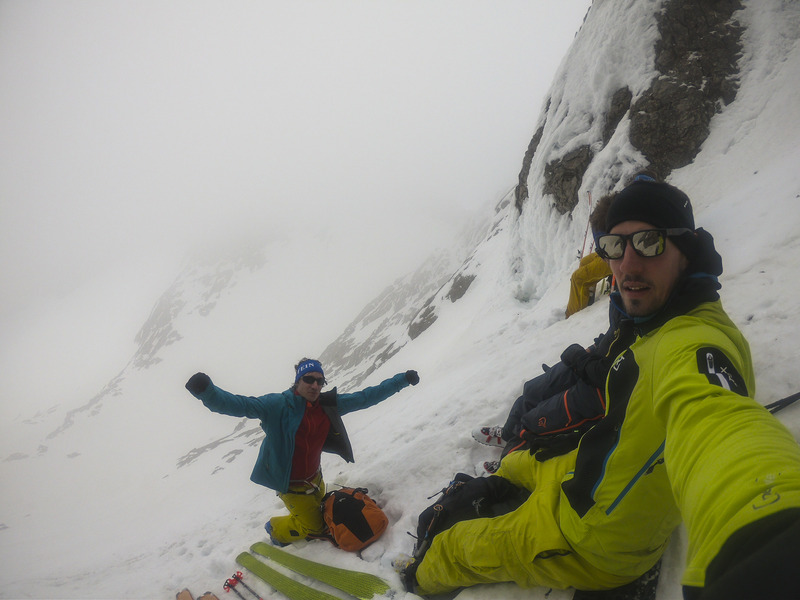 After a short break we decided to climb down to the glacier and try to make it to the beginning of the Torstein climb. After all even if we would not be able to do the main attraction. At least we would have tired to the max. The climb down was funny. A super exposed stone side with a cable attached. One can only imagine the tons of tourists going past here in the summer coming up from Gosau in the valley to the north. The fog cloud was so thick that you could not even see the glacier bellow, or how far up we were. After we made it down the only thing that got us to the beginning of the climb was my Suuntos navigation. It worked in a critical environment. That gave me pause and I was happy since the Spartan was not exactly a easy product launch for Suunto. For those interested in more on this read up on ti here and here. We made a few benches in the steep snow and started a little food break. We debated on weather we should or we should not. 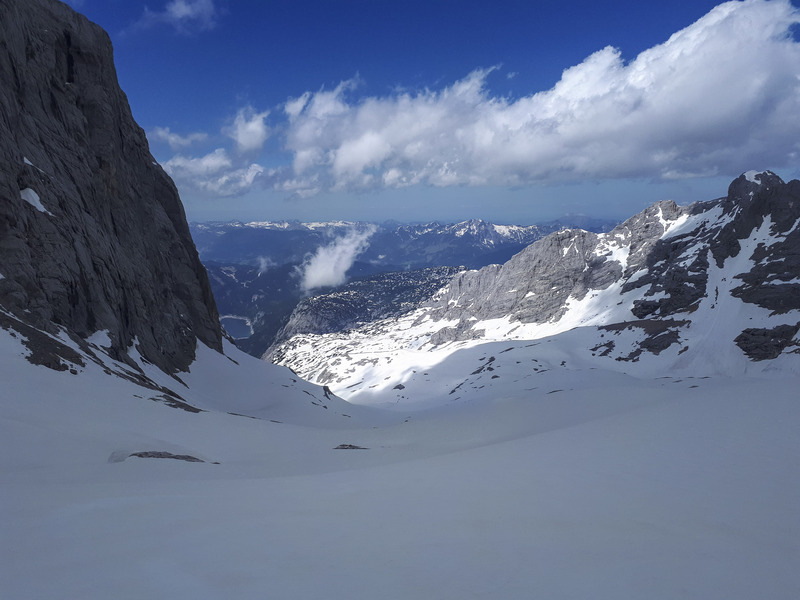 As we ate the weather had cleared up all around the Dachstein plateau. We could see blue sky. Only here at higher altitude, the clouds just did not want to give up. As we waited time was starting to grow thin. Since we would have to make it back to the last cable car, regardless of the long days we had a deadline. Last one leaves at 17.00 hours. Time was starting to run out. As we sat there at one point Flo decided to start ascending. Being as we are, we all quickly started following. After all we do not let anyone go alone. The climb was fun. 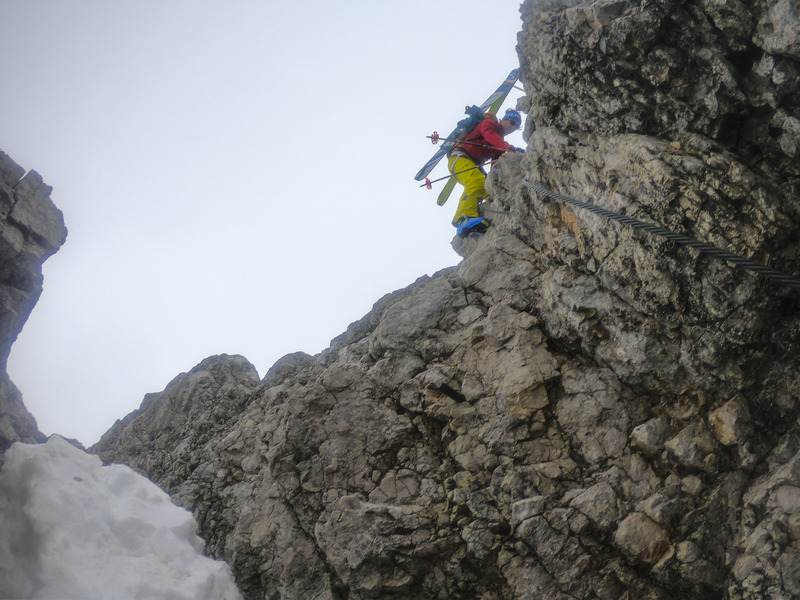 I love it in the steep with ice picks and crampons. You go one step at a time. Like all things in life. You should go one after the other. The climb was not with out treachery. It was late in the season already and the temperatures had been high. We had found a recent record of conditions from two Germans, but those were two weeks old. The snow was wet at the lower part. The effects of prolonged sun exposure were always going to be a problem for this route with its Eastern exposure. Long fall ridges had formed in the snow. Also it seemed like a snowboarder had recently been here and it seemed like he just sided down the whole side of the face. That would be crap for the descent. On the way up we all identified one section almost at the top where the exposure was really bad. If you fell there, well bum game over. After that a few hm higher. The peak. We had made it. The peak was really small. Like a giant tooth sticking onto the sky. There was barely enough space for all of us. Still we were in the clouds. We could not see the probably insane vista surrounding us. But time was short. There was no time for us to wait. We put on our skis an started our descent. The descent is really interesting. While ascending we noticed that a snowboarder had slid of the entire thing. 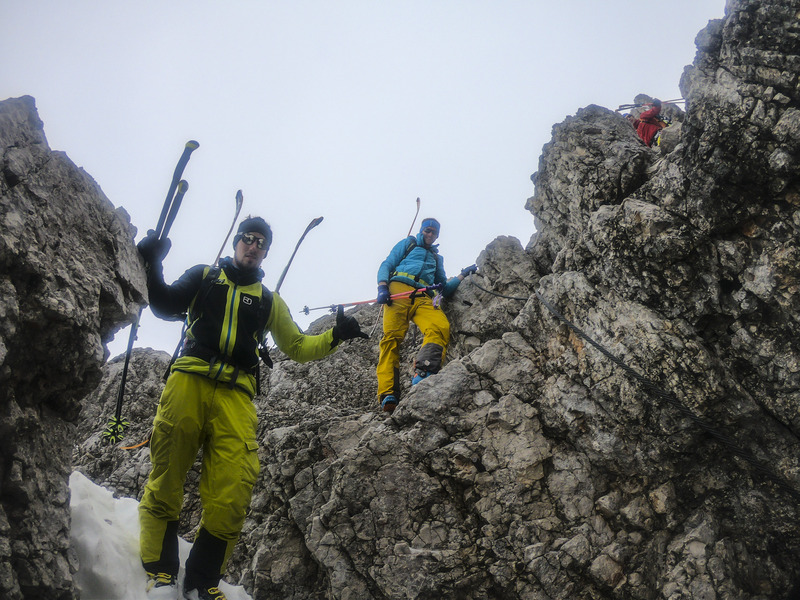 With the wet snow that make our skiing descent a bit edgier. The steep becomes super steel early on. Then at the steepest part there is a overhanging huge rock at the right. This is the a no-fall zone. A few stones were already showing underneath so the skiing was more technical then easy breeyz fun. We proceeded in pairs. I love these steep parts but still it was very much a technical descent. Very carefully we proceeded in the fog. After all the visibility was still bad. After passing the steepest part, that also happens to be the narrowest we made it to the lower part. There chutes had formed. Flo was doing turns and lost one pole. He had lost his poles a few weeks earlier so I borrowed him mine. With the amount of snow coming down after every rider we would not see that one again. Thanks to LEKI for being super great sponsors and keeping me accessorized with really awesome gear :). Finally on the lower part the cloud opened up and it was time to ad some speed and make a few wide turns. And as quickly as the descent started, we were at the bottom. The stark contrast of gravity. Going up takes a bit, going down is always quick. After all one way of the other what goes up always comes down. We regrouped at the bottom. Now the irony became apparent. As we preceded to put our skins on in the course of a got 15 minutes. The weather cleared up completely. The whole Torstein was visible now in blue sky. Dammit I thought. The mountain showed us again that it does things it`s own way. Looking back at it again this sure was steep and it did claim a victim. My borrowed LEKI pole :P. I figured I would do it again in good weather next season. After all I do still wanna soak in the insane vista at the top. 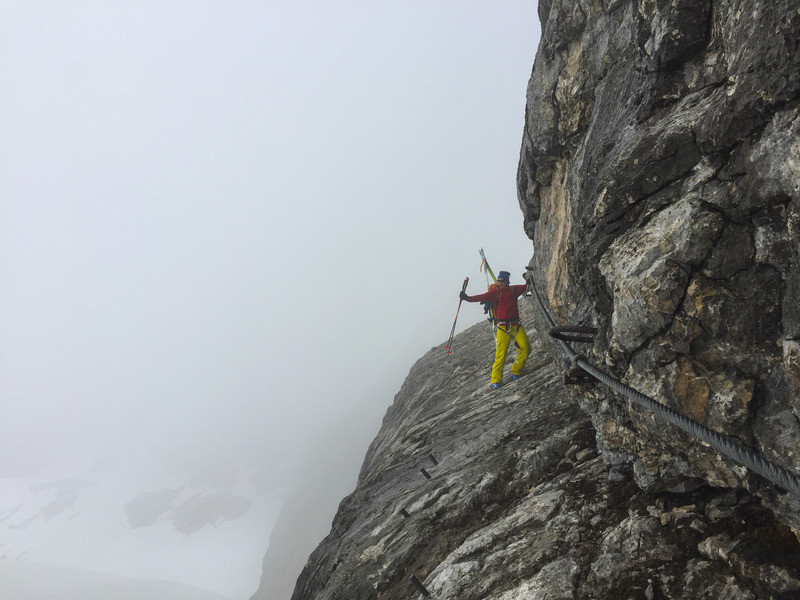 And so we preceded back over the glacier, climbing up the Ferrata to return to the cable car station just in time to catch the last gondola leaving for the valley. It was a really cool and unexpected adventure that dispute the weather toying with us allowed us to reach our illusive goal. It was a good feeling. Mission accomplished and another one ticked of the list a lot sooner. It also was fun to see how far my steep skiing skills had progressed in the last two years. After all if you would have asked me to ski something like this back then I would have probably just said you are crazy. It is funny how perspective changes in time. Exposed to new things our core programming reacts differently and I am happy that mine never goes plank or dismisses something only because it seems unlikely, unknown or daunting. I hope that that continues for years to come, knowing myself thou I think it is fair to say that it will :). I will be off touring around the alps over new years so to all of you who take the time to read on my adventures I wish a good merry Xmas, happy holidays and lot of love happiness and all the good wishes coming true in 2019 :).